SOUTH BEND, Ind. 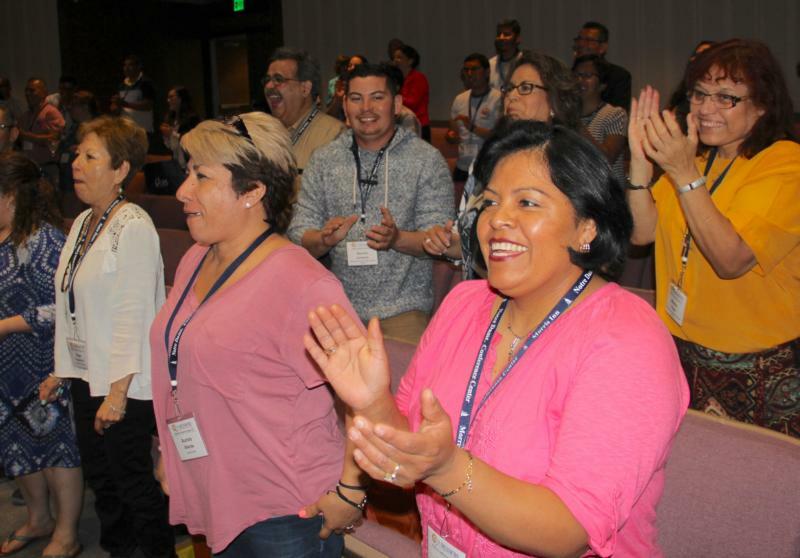 (CNS) — Nearly 200 Hispanic ministry leaders from 13 dioceses in Illinois, Indiana and Wisconsin gathered at the University of Notre Dame for their Region VII encuentro, held June 8-10. “We hope the V Encuentro process can help us by listening to the problems, struggles, and challenges people face in our parishes and dioceses,” said Maria Rodriguez, a delegate from the Diocese of Fort Wayne-South Bend, who is an usher at Our Lady of Guadalupe Parish in Warsaw, Indiana. Besides Bishops Rhoades and Rojas, a handful of other bishops also participated in the weekend long event, among them were Archbishop Charles C. Thompson of Indianapolis; retired Bishop Placido Rodriguez of Lubbock, Texas, who resides in Chicago; and Bishop Timothy L. Doherty of Lafayette, Indiana. Also in attendance was Msgr. James Bartylla, vicar general of the Diocese of Madison, Wisconsin.